This is the eighth in a series of posts on the Sony a7RIII (and a7RII, for comparison) spatial processing that is invoked when you use a shutter speed of longer than 3.2 seconds. The series starts here. Before I conducted the tests on which I’ll report further down the page, I had thought that long-exposure hot pixels were mostly in the same locations from frame to frame. I was wrong. But first, some old business. 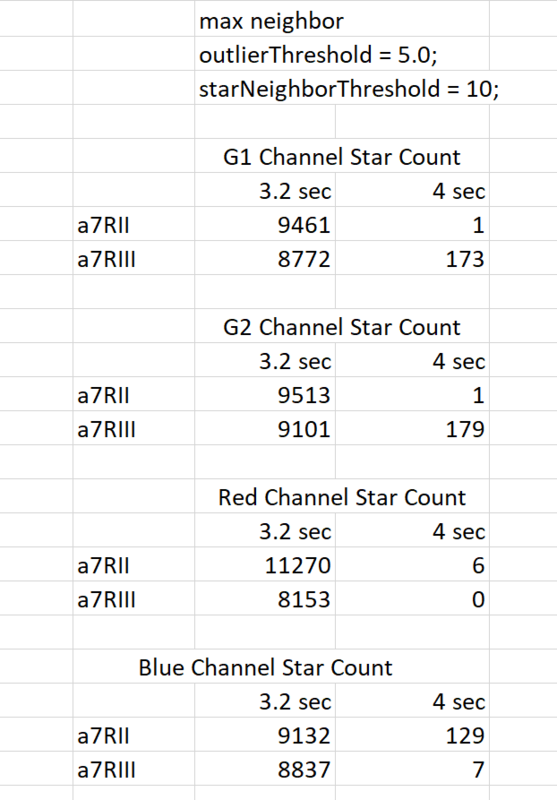 In the previous post, I talked about the differences between 3.2-second and 4-second dark field exposures with the a7RII and a7RIII when the files were subjected to a test that counted the number of star-like objects. Last night I realized that, because I hadn’t noticed a checkbox setting in RawDigger, that I’d processed the images in a space with a gamma of 2.2, instead of the linear space that I meant to use. I added a few lines of code and reran the passes that used the relationship of the outliers’ intensity to the brightest neighboring pixel as a criterion for stardom. The conclusions remain the same, but I am presenting the above in case people are trying to reproduce my results. 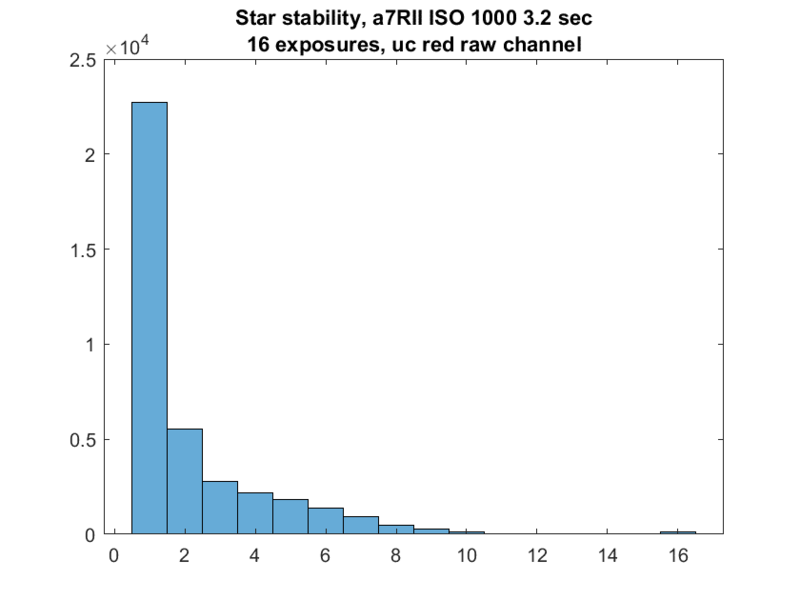 By the way, I ran the star-counter program against synthetic Gaussian random noise fields of the same dimensions as the 11 MP a7RII raw planes and found no stars. a starNeighborThreshold that said that stars must exceed the brightest of their 8 neighbors by a factor of 10. I expected the column labeled “16” to be much higher. In order for a pixel to get counted there, it has to show up as a star on all 16 shots. By far the largest number of stars found were found in that location just once. Now we see more representation at the upper end of the horizontal scale, but still much less than I’d expected. Roughly half the number of stars. Looks like the speculations were well-founded. The distribution seems unaffected. A similar, but not quite so great, diminution in hot pixels. Again, the general shape of the distribution is about the same. 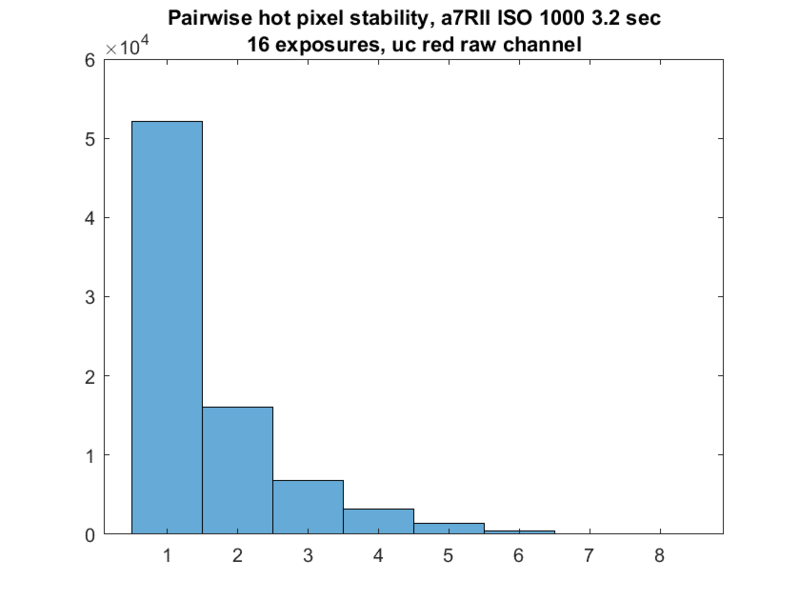 The evanescence of hot pixels in the a7RII explains a lot about why the Sony engineers didn’t simply map them out; they aren’t consistent enough. It also explains why long exposure noise reduction (LENR) is not particularly effective on this camera. 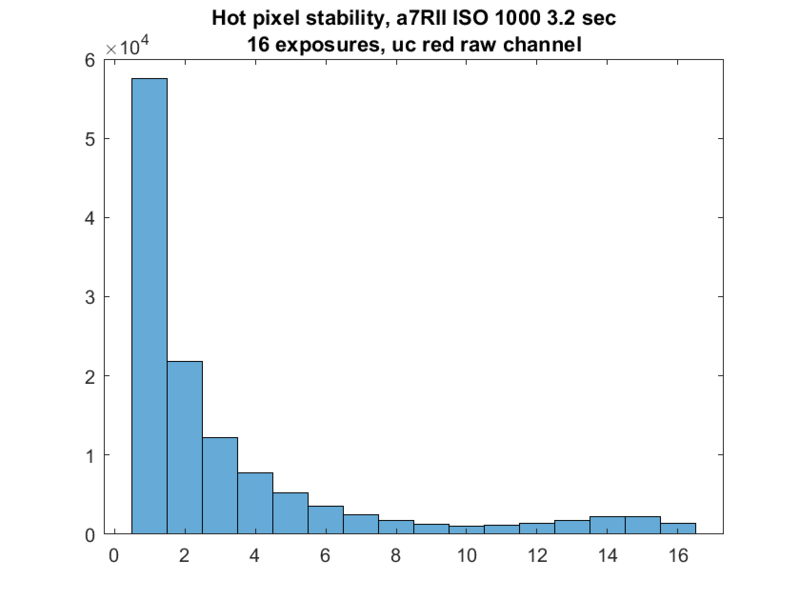 Note that the number of hot pixels has not actually gone down once we double the numbers in the graph above to account for the fact that there are half as many samples. The little bump on the right side that indicates the same hot pixel showed up in capture after capture has disappeared, as expected. That’s what LENR is supposed to do. More great insights here, Jim. In particular it explains why in DeepSkyStacker I get almost all the gains that can be had simply by stacking a good number of (A7RII) image files, corrected for vignetting with an averaged flat file – I’ve always found that adding dark files generally contributes minimal improvement. There is not only hot pixels, there is also hot areas. There are e.g. cameras where one edge of the sensor is hotter than the other due to power being driven from there. All the pixels near that edge are recorded a tad brighter than the rest of the bunch.